Many, many congratulations to Dawn and Eric who were married at the gorgeous Channels Estate in Chelmsford on Sunday 30th July. 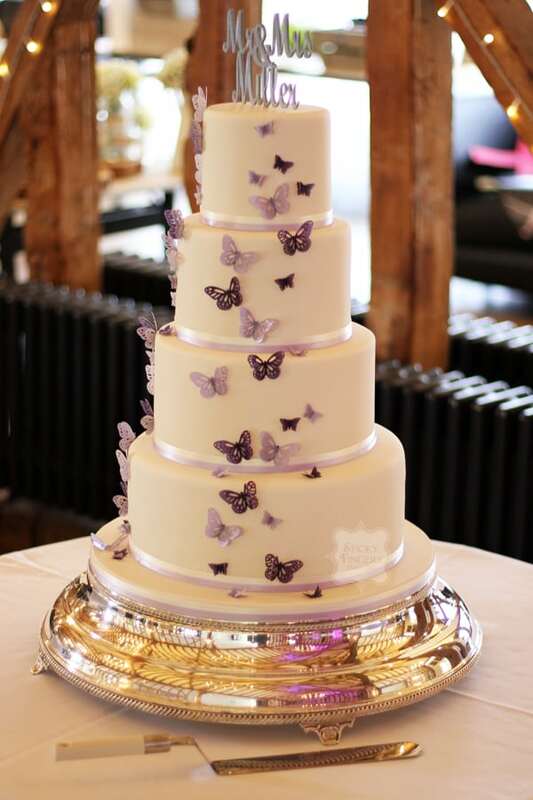 Eric is a massive cake fan and wanted LOTS of wedding cake, so with that in mind their cake consisted of a large strawberry and Champagne bottom tier with 3 dummy tiers on top, decorated with purple and lilac delicate butterflies to match their theme. I also made 3 square cutting cakes for the caterers to cut up and serve with the main cake. These were salted caramel, white chocolate & passion fruit and cookies & cream – over 200 portions of cake! I hope you had an amazing day and wish you a long and happy life together.